This sweet little 5 watt, Single-Ended 6SJ7/6V6 pentode amp is based on the earliest 50s Fender Champs and Gibsons and produces a warm, growly, Chicago Blues tone in a grab-and-go package. This design incorporates a Tone Control which can be bypassed as desired so it is perfect for small gigs and recording. With an optional the 6L6 switched in, it can easily handle larger venues. It is Excellent with Guitars and Harps and takes pedals well. It goes from sparkling clean to brown and creamy distortion. Incredible sensitivity to attack, very nice distortion when you turn it up or use the Hi input jack. With the 6L6 option that the originals didn’t offer, it can seriously bark in the larger venues! Harpdog Brown, 3-Time Maple Blues Harp player of the year, uses his all the time. We added a bias switch so players can use a 6L6 and also a 4/8 ohm output switch and two output jacks used in conjunction with our custom made Heyboer output transformer. Total versatility. What differentiates our kits from others is part quality, fit, documentation and support. 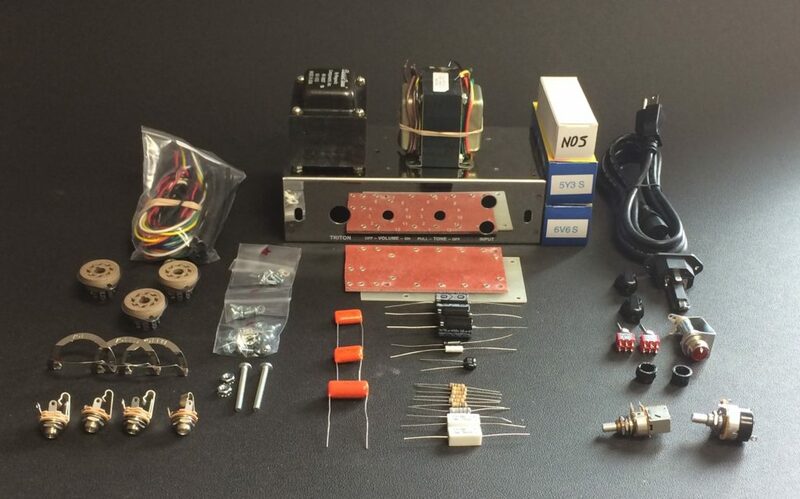 Included is all components required to make a working amp including: NOS 6SJ7 Pentode pre-amp tube, JJ 6V6GT power tube and 5Y3 rectifier); Orange Drop andMallory caps; CARBON FILM & CARBON COMPOSITION resistors; SWITCHCRAFT jacks, ALPHA and BOURNS pots; BELTON Micalex tube sockets & tube retainers; 1/8″ thick GP03 eyelet Board; Carling DPDT impedance and power tube selection switch; 22 gauge hook-up & pre-twisted heater wire; BELDEN Co-Ax cable; All Mounting hardware, spacers and nuts; MIRROR finish Stainless Steel chassis with white lettering on Front & Rear ; Chicken head control knobs; Chassis has tapped holes for tube mounting screws; Assembly guide; large 11″ X 17″ size colour layout and schematic drawings and REAL Support. Also included is our custom made Output Transformer made by Heyboer to our exact specifications. A massive 15 watt Single Ended output transformer with dual primary windings (5K and 2.5K) to support all Octal power tubes. The robust designed power transformer is built by Magnetic Components in the USA with dual primary (120V / 240V 50/60 Hz) & secondary voltage support. Power / Volume control – Rotary ON-OFF switch with Volume control incorporated. Actions: Off – On. Turning the control effects the volume level of the amp. Tone control – Used to adjust the tone to guitar and room dynamics, it incorporates a push/pull bypass switch for those who want raw tone! Click the 'Inquire' button below to receive up-to-date Canadian Dollar pricing and shipping. Triton kit includes tubes and all components except speaker and cabinet. Triton TV Front 1-8 Lacquered Tweed Combo cab.